The latest study by GTM Research finds there will be as many as 40,000,000 public and private EV chargers globally by the year 2030. Its assessment is based on a belief that EVs will represent 11% of the cars on the road by that date, according to coverage in PV Magazine. “Switching from gasoline to electricity will significantly impact commodity and electricity markets. Electricity will redefine how we use our vehicles, as energy networks transport ‘fuel’ instantaneously to any point on the existing network, improve safety, and reduce the environmental impacts of transportation,” GTM says in a summary of its study. 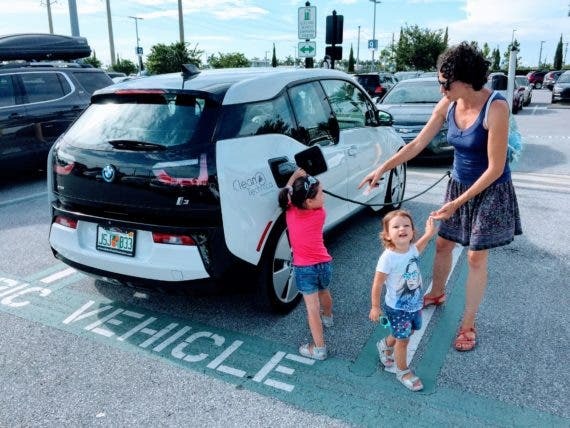 Somewhat surprisingly, GTM sees North America — not China — as the place that will experience the greatest growth in EV chargers — from less than 100,000 today to several million by 2030. That growth comes with significant market opportunities as the sector grows from $2.7 billion over the next two years to $18.6 billion by 2030. The investment is split between physical equipment, installation, operations, and maintenance services. Vehicle-to-grid systems are also expected to increase dramatically. In essence, V2G turns the batteries in electric cars into energy storage units that utility companies can access to provide voltage and frequency stabilization to the grid as well as draw on during periods of high demand. Using advanced digital control systems, the system administrators will know when a particular car needs to be charged and when it can contribute some energy back to the grid. A similar system using Tesla Powerwall batteries has proven its worth for Green Mountain Power in Vermont, where its ability to draw energy from about 400 networked residential batteries saved it over $500,000 during a recent heatwave. Some EV owners worry that allowing the batteries to interface with the grid in a two-way arrangement will degrade those batteries faster than normal use. That question is yet to be definitively resolved. But in a recent experiment in Denmark, participants in a pilot program earned up to $1,500 from their local utility for allowing the batteries in their electric cars to be tapped on demand. A little cash back could help ease the pain of any possible degradation. And being able to use the battery in your car to help power your home is a feature many would welcome. In order to enable this explosive growth, GTM says “utilities, along with manufacturers, oil and gas giants and sector-specific specialists, will need to test new business models.” According to ThinkProgress, that is already happening. Volta Charging has raised over $60 million so far to fund its ad supported network of free chargers. As cars are plugged in, drivers are exposed to video ads similar to what they see already on gas pumps as many fueling stations. Volta says it has already provided customers with enough free electricity to drive more than 22 million miles. More innovative ideas are sure to be tested in the marketplace as the transition to electric vehicles continues.